Cross docking is a logistics treatment where items from a provider or manufacturing plant are dispersed straight to a customer or retail chain with limited to no handling or storage time. 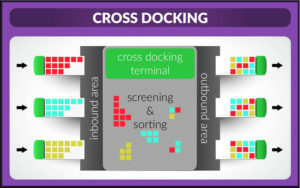 Cross docking occurs in a circulation docking terminal; usually including trucks and dock doors on two (inbound and outbound) sides with very little storage area. The name ‘cross docking’ discusses the process of getting products through an incoming dock and after that moving them throughout the dock to the outgoing transport dock.